Living a Fit and Full Life: Disney Side Home Celebration!!!!! Yay! So excited!!! This will be one awesome party! 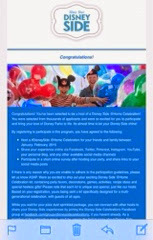 Stay tuned for my unboxing.... My Disney Side Home Celebration Kit will be here next Tuesday! First real workout during this pregnancy!